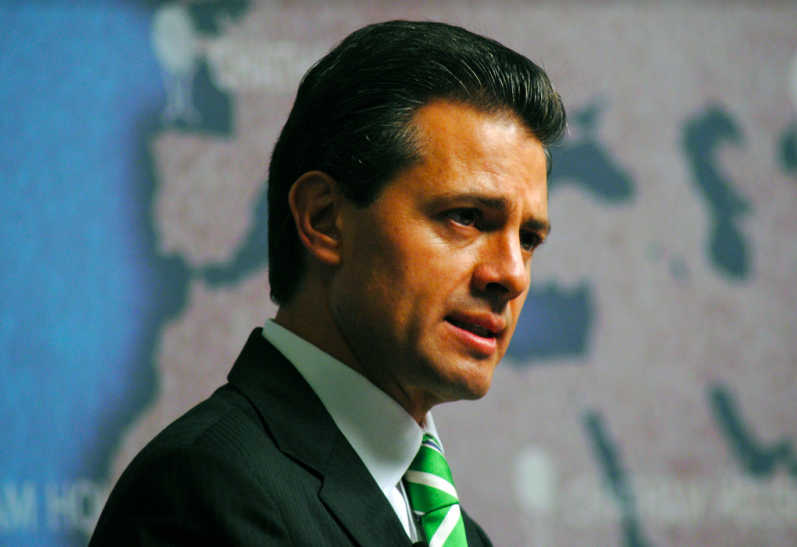 On December 1, 2012, Enrique Peña Nieto stood before the Mexican Congress and declared that “this is Mexico’s moment”. The newly inaugurated President asserted that his administration would pursue a bold agenda of structural reforms to end the country’s epidemic of violence and establish Mexico as a prominent economic power on the world stage. However, in the five years since this ambitious inaugural address, Peña Nieto has routinely found himself embroiled in a number of high profile corruption and human rights controversies that have stalled much of his agenda and inflicted pain on the Mexican people. As he enters his final year in office, it is not surprising that President Peña Nieto has one of the lowest approval ratings of any Mexican President in recent history. After serving one term as Governor of the State of Mexico, Enrique Peña Nieto launched himself onto the national political scene in late 2011 by announcing his intention to seek the Institutional Revolutionary Party’s (PRI) presidential nomination. The then forty-five-year-old used his charisma, good looks and mysterious persona to grab the country’s attention and quickly become the election’s front-runner. His comprehensive plan to reform Mexico’s education, economic and energy policies helped him to consolidate support and ultimately be elected as Mexico’s 57th President. President Peña Nieto’s tenure got off to a promising start when he showed an impressive ability to reach across Mexico’s partisan divides and establish the Pact for Mexico- a common reform agenda formally endorsed by PRI and its two rival parties. Peña Nieto acted quickly to implement a number of the key education, banking, and fiscal reforms set out in the Pact. Perhaps most significantly, Peña Nieto’s administration ended the state’s traditional monopoly over oil and gas extraction, an achievement many experts had long opined to be politically untenable. President Peña Nieto also achieved some early political victories with regard to violence and crime, including a noticeable reduction in the national homicide rate and successfully arresting famed cartel leader Joaquin “El Chapo” Guzman. While Peña Nieto was quick to take credit for this reduction, his administration became increasingly quiet on issues of crime and violence in an effort to avoid public scrutiny. The President’s early momentum came to a halt in the fall of 2014 when 43 students from a rural teachers’ college in Ayotzinapa, Mexico were forcibly disappeared. In the months following the crime, Peña Nieto’s government proved to be both insensitive to the concerns of the families affected by the tragedy and actively involved in covering up the crime. In fact, the government’s official narrative on the case has been disproven by multiple teams of independent investigators. Independent investigators have also concluded that federal authorities were likely directly involved in facilitating the disappearance of the students. The government’s response to this case ignited an extended series of protests across Mexico calling for the President’s resignation. Although Peña Nieto was able to withstand this pressure to resign, he did not emerge unscathed. This tragedy laid bare a reality that many Mexicans had long suspected - the Mexican state is incompetent, complicit in criminality, and fundamentally unaccountable to its citizens. The Ayotzinapa disappearances were but one case in what has become a full-scale human rights crisis in Mexico under Peña Nieto’s presidency. A leaked government document estimates that approximately 33,000 Mexicans are missing as a result of forced disappearances. Despite their apparent acknowledgment of the issue, Mexican authorities have proved to be both uninterested and incapable of investigating these cases. This apathy and incompetence has inflicted enduring pain on the families of the victims and has allowed the criminal cartels suspected of these acts able to escape with almost complete impunity. President Peña Nieto’s trouble with organized crime goes well beyond the issue of forced disappearances. Cartel violence, killings and extortion continue to be an ever-present reality in the everyday lives of Mexicans. In fact, the government’s failure to deal with these issues has caused an increasing number of communities to form armed self-defence groups (autodefensas) to protect themselves against cartel violence. The public’s perception that the government of Mexico is incompetent when it comes to protecting public security was reinforced when “El Chapo” Guzman escaped from prison in July 2015. Although Peña Nieto’s administration has steadfastly stated that Guzman escaped from the prison through a tunnel, many experts and citizens believe that he was released to restore order in what had become an increasingly violent cartel world. Despite the fact that Guzman was arrested again in 2016, his escape is still widely considered to be an embarrassment for the Mexican government. Beyond the aforementioned difficulties with criminality, Peña Nieto and First Lady Angelica Rivera Hurtado have themselves been implicated in a number of conflict of interest scandals involving real-estate assets. Since late 2014, investigations have revealed that the President and the First Lady maintain residence at various properties owned by Latin American business interests. One of the properties - a luxurious mansion - is formally owned by a subsidiary of a company that was awarded a multi-billion dollar infrastructure contract by Peña Nieto’s administration. These revelations reinforced the Mexican people’s growing distrust in President Peña Nieto and robbed him of the legitimacy required to push forward his policy agenda. Peña Nieto’s corrupt practices, incompetent leadership, and atrocious record on human rights have caused Mexicans to lose faith in their government and become distrustful of public officials. This erosion of trust threatens to undermine the legitimacy of Mexico’s institutions of accountability. In fact, widespread dissatisfaction with Peña Nieto appears to be influencing Mexico’s electoral landscape. The majority of recent public opinions polls indicate that Andres Manuel Lopez Obrador, a brash populist from the left-wing MORENA Party, is the favourite to succeed Peña Nieto. An Obrador victory in the upcoming July election would mark a significant departure from the electoral status quo as it would end the ninety-year bipartisan dominance of the Institutional Revolutionary Party (PRI) and the National Action Party (PAN). However, in recent weeks a growing number of independent candidates have announced their intention to run. The presence of anti-establishment alternatives may undermine some of Obrador’s appeal and complicate his path to Mexico’s highest office. Likewise, a crowded field may open the door open for the PRI or PAN to maintain control of the presidency. Regardless of the eventual outcome, the next eight months promise to be an interesting period in Mexican politics.